The Electra Forums • View topic - Electra P Bass identity/date question. 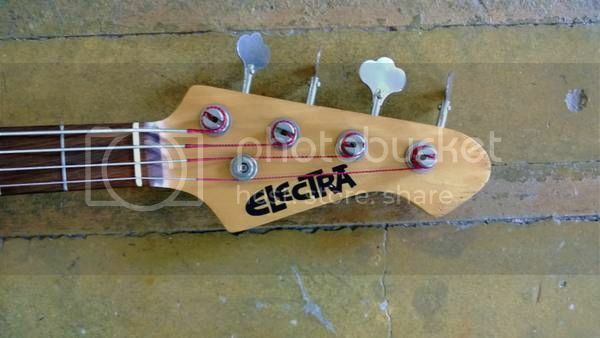 Electra P Bass identity/date question. 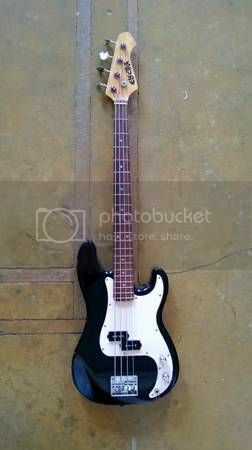 Post subject: Electra P Bass identity/date question. I'm new to the forum.. wondering if someone can help me identify and date this Electra P Bass I just acquired. The headstock is different from anything I've seen so far.. the bass is very heavy.. person I got it from had no idea when it was from... thanks in advance.,, has this number on the neck plate CH005692. Post subject: Re: Electra P Bass identity/date question. Unknown Dist, Bird Beak headstock, mid 80's to 90's.... Thanks Mcbrat!.. any idea of where it was made? I really like this one but in trying to do a set up I couldn't access the truss rod without removing the neck. It doesn't have a notch cut out to access the rod under the pick guard.. I guess I will have to bring out the Dremel tool and take care of that. The unknowns have been seen with Japan markings and Korean sometimes..
Also, the pass copies around this time were pretty standard so you could have a different body since it doesn't have the truss rod access. So this past weekend I did a set up and intonation to the bass.. It appears the neck and body are not original to each other. Like I mentioned before the truss rod was not accessible with our removing the neck due to the body not having a notch to slip an allen wench into the truss rod... I made a notch with my dremel tool and did an adjustment and intonation.. I love the bass, plays like butter now ( "butter" I think that means good)... I've been trying to identify the body but no luck.. the pick guard has 14 holes and the bridge looks like a Schaller but not sure since it doesn't have any markings and I don't want to remove it now that I put the bass back together... Enjoying the bass and I'm recording with it next month... I think I'm gonna called it a Non-Electra. Thanks Mcbrat and the readers.